Prototype: Type Sggrss 80 6-axle double container transport car with articulation, for combined freight service. Black basic paint scheme. Privately owned car for RailReLease B.V., Rotterdam, Netherlands, registered in the Netherlands. Loaded with two (2) 40-foot box containers. The car looks as it did around 2016. Modern electric freight locomotives in the classes 152, 185, 189, 193, or 1600 to go with this car can be found in the Märklin H0 assortment. 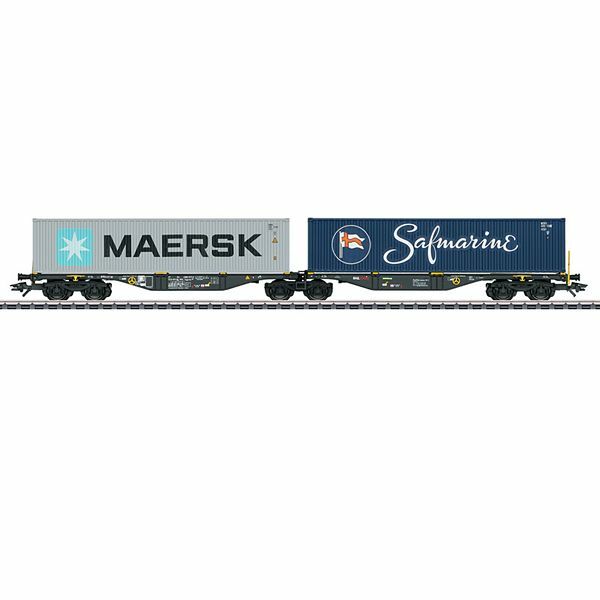 Additional double container transport cars to form unit trains can be found under Märklin item numbers 47805, and 47808 as well as Trix item number 24802.